Clogau's Timepieces collection reflects the tradition and quality of the skilled watchmakers of our past and includes rare Welsh gold that is true to our Welsh heritage and distinctive style. 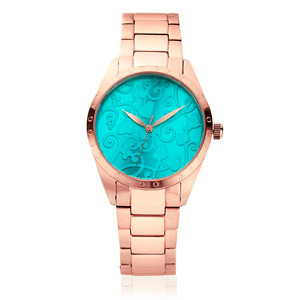 This contemporary rose gold plated watch incorporates the iconic filigree and recognizable rose tones, with an impactful pop of colour with the turquoise face providing a stylish timepiece that can be worn for any occasion. Containing rare Welsh gold, these elegant sterling silver and 9ct rose gold earrings feature Zircon stones, the birthstone for April. Zircon is an historical gemstone that has been used for thousands of years and is today used as an opacifier, whitening agent, and pigment in glazes and stains on ceramics and pottery. Zircons are some of the oldest stones that have been used on the planet, and the meaning of their name dates back to an ancient Persian word. Containing rare Welsh gold, this elegant sterling silver and 9ct rose gold pendant features Zircon stones, the birthstone for April. Zircon is an historical gemstone that has been used for thousands of years and is today used as an opacifier, whitening agent, and pigment in glazes and stains on ceramics and pottery. Zircons are some of the oldest stones that have been used on the planet, and the meaning of their name dates back to an ancient Persian word.